Whether you are looking for a computer desk for your home or your office, we have the best selection of mango, painted and oak computer desks. 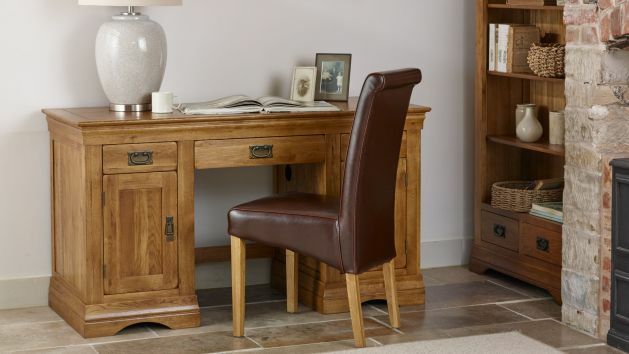 A desk is the centrepiece of the home office, which is exactly why we’ve designed a stunning range of 100% solid hardwood options for you to create a workspace that is perfect for you. Our computer desks are constructed from the highest grade of oak, mango, and hardwood timbers in a variety of stunning finishes, ranging from modern to more traditional styles. Choose from painted styles with beautiful solid oak tops, dark-stained hardwood computer desks, and of course, plenty of stunning options to choose from in our popular natural and rustic oak wax finishes. Designed for modern working, our desks feature a mix of storage facilities, including cupboards, pull-out keyboard storage, and drawers with real dovetail joints and solid hardwood bases, backs, and runners. Each desk has special hidden openings at the back to conceal messy cables. All our mango, painted and oak desks are made to complement our furniture ranges, so whether you have a dedicated room for your workspace, or if it is incorporated into your living room or dining room, your new desk will always look fantastic. Browse all our mango, painted and oak desks and start creating your ideal dedicated space for flexible working today.